The Chelsea Royal Diner in West Brattleboro, Vermont, is now a vacation destination. It’s rare that a restaurant, still less a diner, would be chosen is the raison d’etre for a visit to Vermont or anywhere else. Usually travelers go to Vermont in the fall for the leaves, in winter to ski, in the spring to break a leg in the metaphorical sense of the word and in the summer for hiking in the mountains. 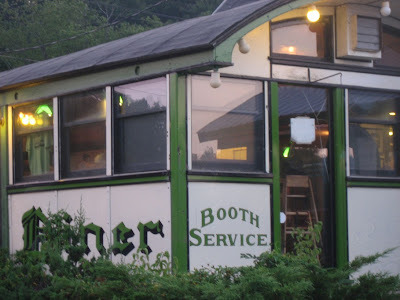 But why bother with these things when you can attend this dynamic restaurant in the shape of a railroad car, with an old-fashioned jukebox in the front? Make a weekend of it. You can stay down the road at the Holiday Inn Express. This not one of those ersatz affairs like say Manhattan’s Brooklyn Diner, with its theme-park Las Vegas feel. It’s the real McCoy and serves both a standard menu and home-cooked daily specials that are listed on a black board. You can get the sirloin tips or fried haddock, soup or salad and dessert or coffee, all for $7.99 on the early-bird special. On weekends Mexican food is served, and the Chelsea Royal boasts an award for best Mexican in Brattleboro in 2007. The lamb shank, at $l0.99, was one of the specials on a recent night, and the diner is renowned for its buffalo wings. If eating creates a state of mind, it’s not an exaggeration to say that well-being is the dish served at the Chelsea Royal. Back in the ’60s people went to Esalen and Big Sur to get high. The Chelsea Royal creates its own high through a feeling of instantaneous intimacy that’s not something to scoff at. It’s the direct opposite of the feeling you get when you walk into a four-star Michelin restaurant and feel you’re doing something wrong before you’ve even ordered.